 I am sorry I have been away, and unable to blog as of late. I went on a diet and workout regiment. Yes, the Hunting Chef has to watch his waist band from time to time just to keep in hunting shape. 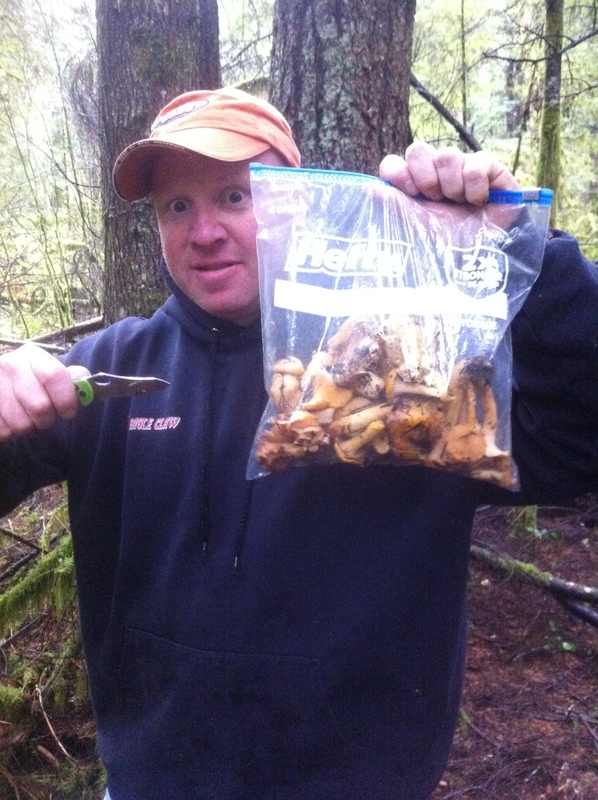 This blog is about hunting the illusive Oregon chanterelle mushroom with my ole pal Trevor Storlie and one of my favorite characters that I feature on the Hunting Chef site. His wife always calls jump me about harassing him on the internet, then she calls and complains that I have not blogged in a while. Sometimes it is just plain hard to make everyone happy. Plus I had to wait a long time to post this one because the Saturday we went picking, Trevor told her we were looking at fishing rods or something for his work, he is a fishing guide and uses the fishing rod excuse every month because he forgets he used it the previous month. Hunting Chef and his favorite mushroom hunting assistant. You cannot really see my bag, but it is twice as full as Trevor’s. Trevor took me up near his house where he knew of some “Honey Holes” and we spent a few hours rummaging thru the forest floors looking for a glitter of Orange barely coming up thru the fallen leaves on the ground. Immediately it goes into a competition and the “Ring” is already back on line. The ring is worn by man who brings in the most mushrooms. We call thy ring….Precious. 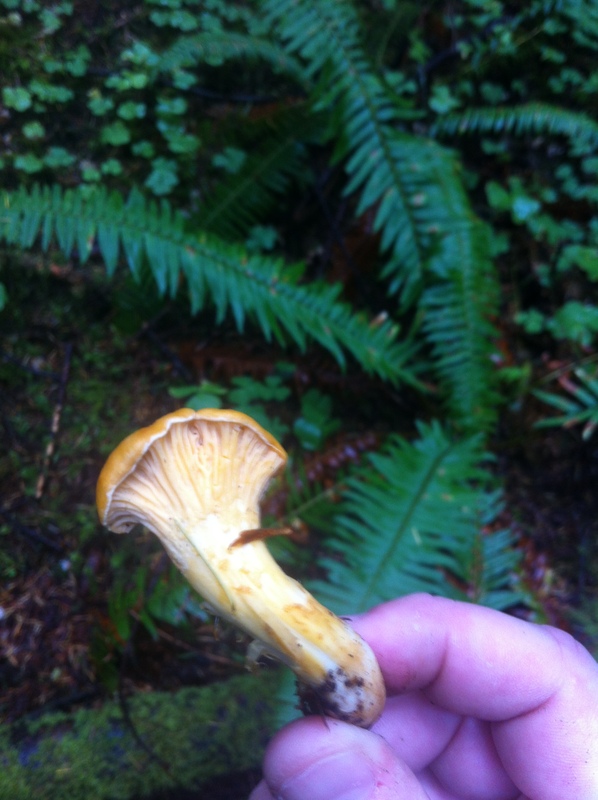 This is what a Golden Oregon Chanterelle Mushroom looks like. 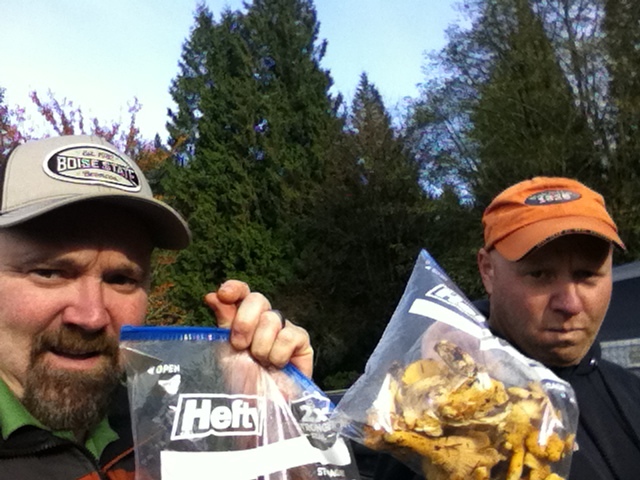 Trevor likes the Chanterelle better than the Morel, but I like them both. 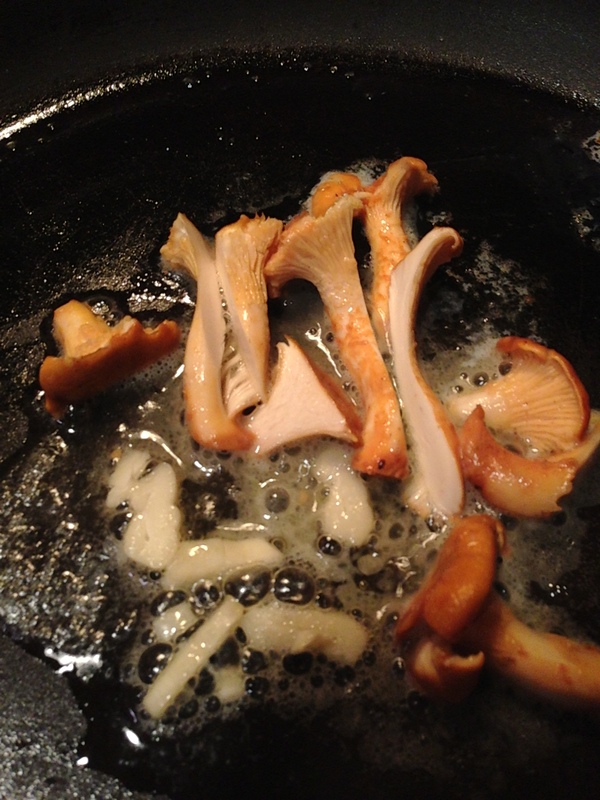 However, if I was forced to choose I think I would take the meatier Morell over the Chanterelle. I do like the fact that the Morel comes in the Spring, where the Chanterelle grows in the fall. 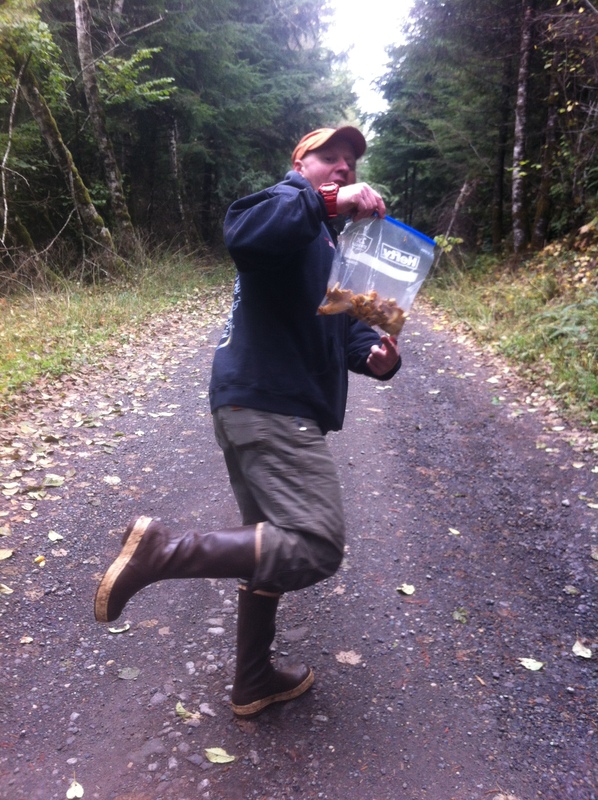 This is what a happy picker looks like. Nice form buddy! Trevor wins the Precious Ring this day, and because we only got to go for a couple of hours one day and he and his wife decided to buy a house with a 50 acre yard he has his mowing responsibilities every weekend. I miss my buddy, and sometimes I contemplate back burning his entire yard. 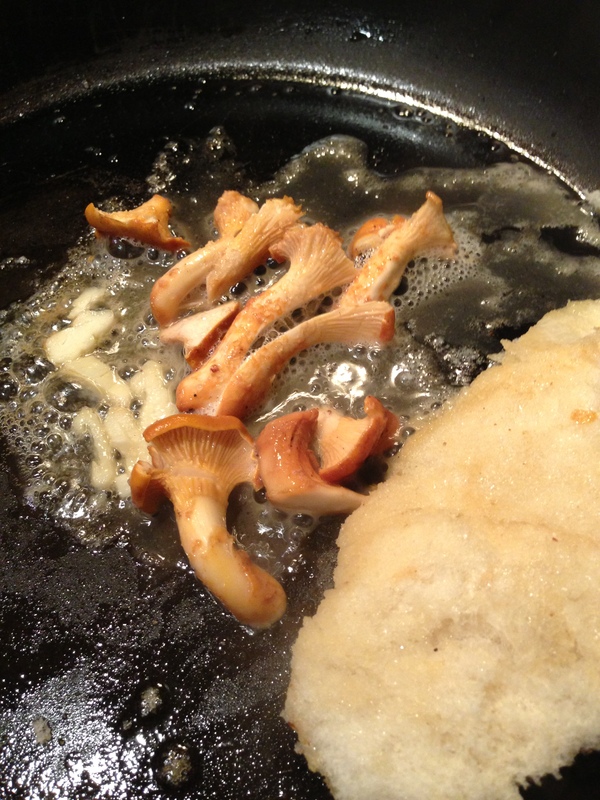 I like to take a little butter, and some white wine and cook the mushrooms with some garlic on medium heat. 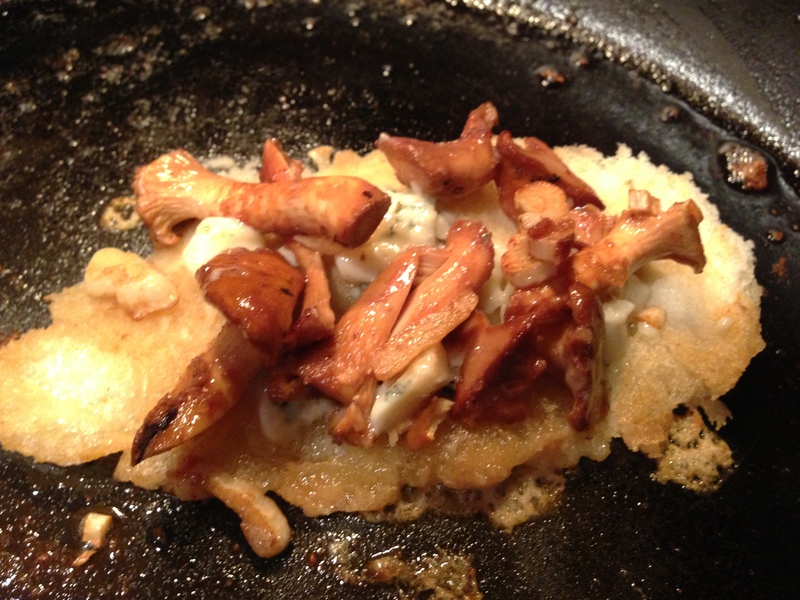 Then toast some bread with some blue cheese, and top with the cooked mushrooms. That there is Redneck Money. Saute the Mushrooms and a little garlic, butter, and white wine. Take the fresh bread and slice it. Do not use Franz white bread people. I was kidding about the Redneck thing. Toast your bread in on the same pan. Add your blue cheese and top with your mushrooms and garlic. This is gonna make you very, very happy. Just plate it and serve! I am not sure what Trevor does with his mushrooms. He never really talks about it. This is great on pizza, pasta, and steak. 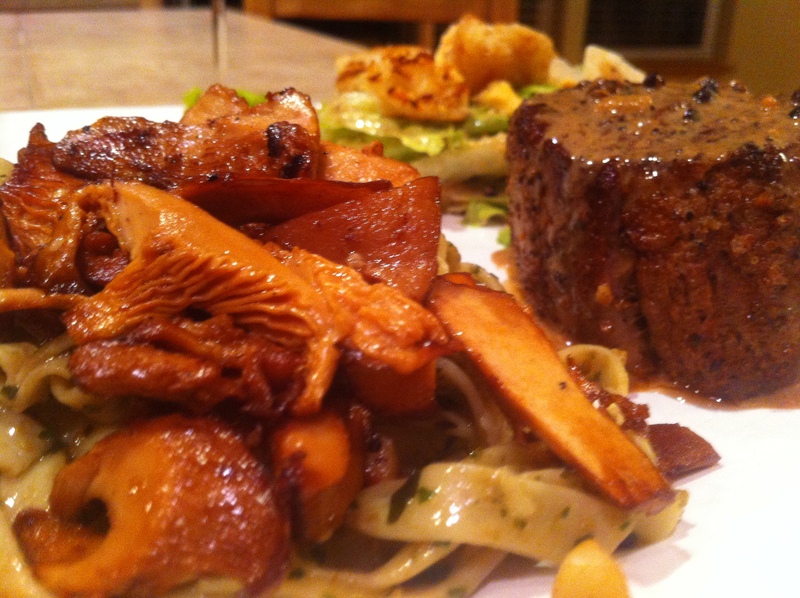 Pesto Pasta with Chanterelle’s over the top drizzled with truffle oil and served with a Filet Mignon. Man, I am hungry just writing about this. This blog goes out to all those men that has a “Honey Do” list so long they can no longer find the time to hunt with their pals. This one is for you Trevor Storlie, the “Ghost of the Woods”. I call him that not because he is cool and quiet in the woods, because he is busy at home and is a Ghost to the woods. Get out their and enjoy the wild people. Oregon is amazing for this, and I am grateful I live everyday here.